Fighting for the chance to confront God is hard enough, but high school student and genius mechanic Tazuna has it tougher than most. 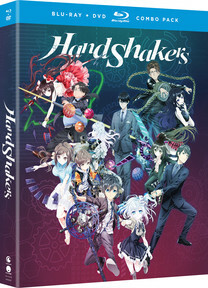 When he happens to hold hands with a girl in a lab, the two form the contract of Hand Shakers—couples who must fight in otherworldly battles to have a wish granted by God. There’s just one catch: Tazuna’s partner, Koyori, will die if she lets go of his hand.